DES MOINES, Iowa -- Michigan is back in the Sweet 16 for the third consecutive year after pulling away for a 64-49 win over Florida in the second round of the NCAA Tournament on Saturday. The 10th-seeded Gators (20-16) shot just 29 per cent in the second half, 34.5 per cent for the game and were held to their lowest point total of the season. The matchup was a meeting of two of the nation's highest-ranked defences and produced rag-tag play. Florida played its usual combination defences and caused confusion -- Ignas Brazdeikis had an entry pass intended for him sail right past him out of bounds, and the 7-foot-1 Jon Teske fumbled the ball down low repeatedly as the Gators swatted at it. He didn't score another point the rest of the game, but his bucket started an 11-0 run that put the Wolverines up 43-28. The Gators scored nine straight points to close the gap before Poole was fouled shooting a 3 and made all three free throws. The Michigan lead was back to double digits when Livers took a bounce pass from Brazdeikis, drove on Kevarrius Hayes, got fouled and made the free throw with 7 1/2 minutes left. Florida: The Gators played one of the toughest schedules in the country and turned it up at the end of the season after finishing eighth in the Southeastern Conference. Florida upset LSU to make the NCAA Tournament for a third year in a row under coach Mike White. The Gators beat Nevada in the first round but met their match against a Michigan team that mixes a lockdown defence with an offence with multiple threats. 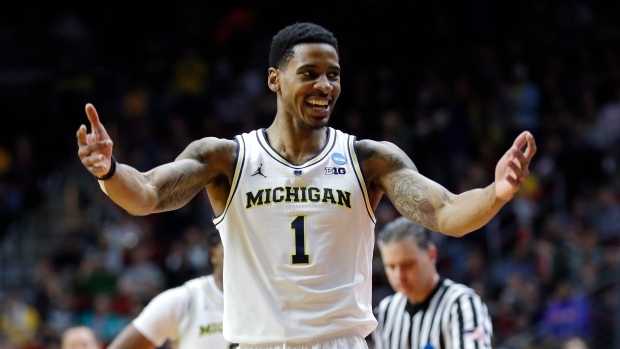 Michigan: John Beilein was worried about how the Wolverines would handle Florida's defence. It turned out Michigan's defence was the story of this game. Michigan's only three losses since mid-February were to Michigan State. The Wolverines are 30-3 against everybody else this season.